Moderators may invite others to a Collaborate session by using the menu Tools > In-session Invite > Invite New Participant. This will provide a link which can be emailed to the invitee. To join a Blackboard Collaborate session you need a current version of Java installed on your computer. Click here to see if your computer is correctly configured. You will receive a link (usually by email) that will invite you to the session. Click on that link or past into a browser. You should see this screen. The download page appears and the meeting.jnlp file will download. As a message at the bottom of the page – it may first ask whether you want to “keep” the file – do so – then whether you want to open or save it. You should open the jnlp file – this will connect you to the Collaborate room. Note on the page above there is also a link to “manually start this session” – click there if you don’t see the download yet. Do NOT click on the “Return to the sessions page” link. Once the session has been downloaded and begun to be initialized – the page will change to the appearance above. If you get re-directed to the sessions page it will look like this. You will not be able to find your session here! Click the “back” button to go back to the previous page and click on the link to “manually start the session” – the jnlp file will be downloaded again. You may encounter various security warnings – the two shown above will not interfere with the meeting opening. Course materials, tests, and activities can be copied from one semester to another. The biggest thing to be aware of when copying course material is that some components of your course may be linked to other components. For example – a test deployed in a content area is linked to the grade center and to “Tests, Surveys and Pools”. All three things need to be copied. The safest way to proceed is to copy the entire course, then delete what you do not want. After you copy a course it is important to wait a while – even after the course copy email is received, wait a good half hour or more before trying to edit the course – otherwise you are apt to be frustrated by items that refuse to be re-ordered or edited! Go to the course you want to copy material from. Click the Browse button – you’ll have a list of all courses you have access to. Find the NEW course into which you want to copy. The list of courses is ordered by semester. There may be more than one page of courses. Don’t worry about boxes that are unchecked when you click Select All. Uncheck "Limit package to only files linked to from the selected content areas". Unless you are sure that you only want to copy resources and files that are linked to from the course, uncheck the box in part (3.) labeled “Limit package to only files linked to from the selected content areas”. It is particularly important to do this if you’ve uploaded “zipped” packages of content (such as Softchalk lessons for example). A Success message appears. You’ll get an email announcing when the copy has completed – however DO NOT EDIT THE COURSE for a while even AFTER you get the email. Trying to edit the course too soon will cause headaches when course material won’t properly edit or allow itself to be re-ordered. Make sure you SCROLL down – the copied content may be at the BOTTOM of your course menu. If you have a success message and a log file that has no fatal errors – don’t try to copy again! You’ll likely end up with duplicates of everything in the course! If the NEW course has a content area with the same name as the OLD course – content and activities will be copied there. For example, if your NEW course has a “Getting Started” content area, then content from the OLD course’s Getting Started area will be copied there. If the OLD course has a content area that has a different name (doesn’t appear in the NEW course) – then it will be copied to the BOTTOM of the NEW course menu – you’ll need to re-order things. 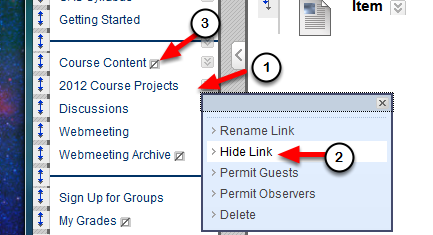 For example: your OLD course has two content area named “More Links” and “Final Project” – in the NEW course they will be copied to the bottom of the course menu and need to be moved to the appropriate locations. Re-ordering items on the course menu. “Grab” the up-down arrow next to the menu item (click on the up-down arrow, do not release) and “drag” the menu item to the appropriate location. 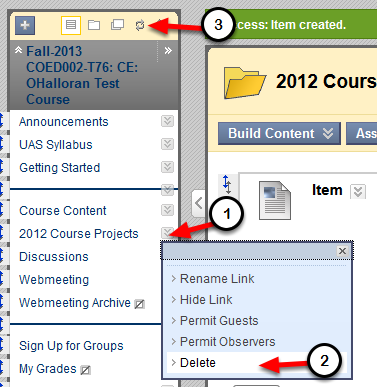 To delete something from the course menu, click on the drop-down menu to the right of the menu item (1) and choose Delete (2). While you are editing the course you may want to hide content from students. 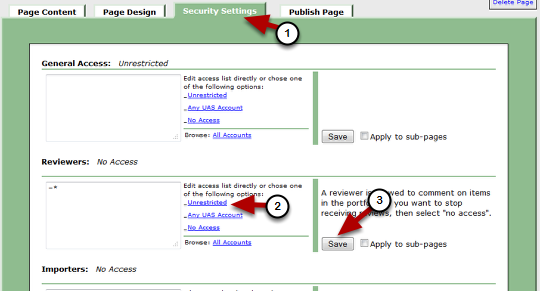 To do this use the drop-down menu next to the content area(s) ((1) in the figure above) and choose “Hide Link” (2)). 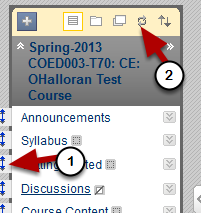 When Content Areas are hidden from students you’ll see a square with a slash through it next to the menu item (3). Blackboard copies Discussion Forum posts from one course to another but changes the authorship to anonymous and doesn’t copy replies. Blackboard has an handy-dandy tool to change all the due dates in your course at once! One that page you’ll see everything in your Grade Center which has a due date and have the opportunity to change due dates and set availability. For the date(s) chosen the time will be set to 11:509 pm. Due dates are visible to students in their gradebook (My Grades) but do not limit availability. Consider making parts of your previous course unavailable (if there is material that you don’t want current students to have access to). Change the colors of your OLD course (Control Panel > Customization > Teaching Style) so that you don’t confuse it with your new course. Check your deployed exams, graded discussions, assignments, etc. to change their availability and set the appropriate level of feedback. If your course is organized as folders you can control availability on a folder-by-folder basis. 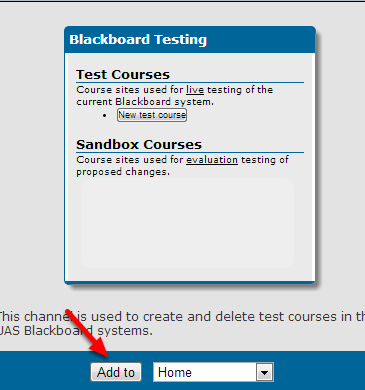 UAS faculty and staff have the ability to create “test” courses in Blackboard. Test courses can be used for experimenting with Blackboard or for developing new courses prior to the normal semester courses being created. They are not used for teaching purposes. What you see is an image of what the new channel will look like – click the “Add to” button to add it to your home page. Click the New Test Course button to create test courses. They will be created in the “Test” semester. You can create up to five test courses. Next to each will be a “delete” button. Test courses are in the Test semester are on the same server as regular semester courses and content can be copied to other courses. Here is how to export a single test (rather than all tests or the whole class. 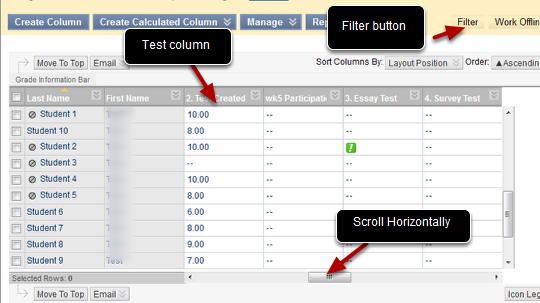 In Blackboard Tests live in the “Test Manager” but are deployed in particular content areas and also have associated columns in the Grade Center. 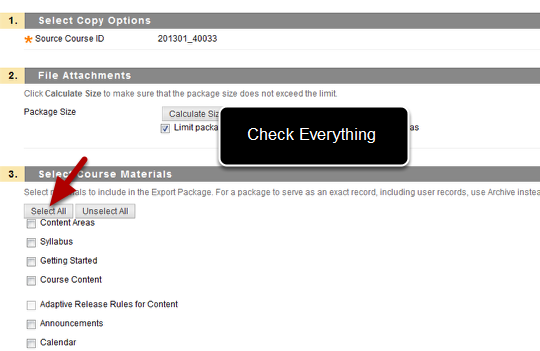 To use Course Copy or Export/Import from “Packages and Utilities” to move a single test is not possible. However there is an alternative. NOTE – this does not work for tests which are drawing from Pools or other Tests as Random Blocks, Question Sets, etc. Your test now “lives” in Tests, Surveys and Pools but must be deployed. Using the Course Menu, go to the Content Area on the menu and then to the folder where you want to deploy the test. 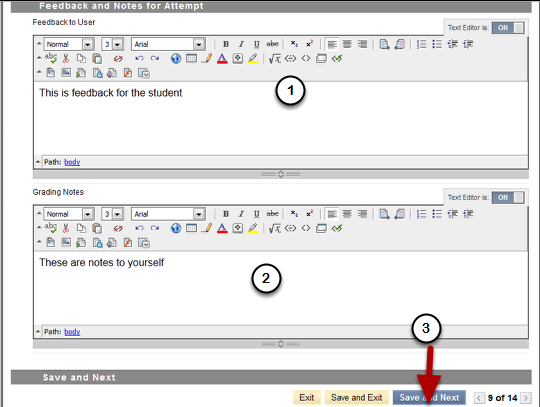 Set the test options – you can write a description for students to see when they see the link to the test. Tests are unavailable by default – at the very least you must change “Make the Link Available” before your students can see the test. Once you’ve chosen Yes, you can also set a time window for availability, but if you leave it at “No” it will NEVER be available. 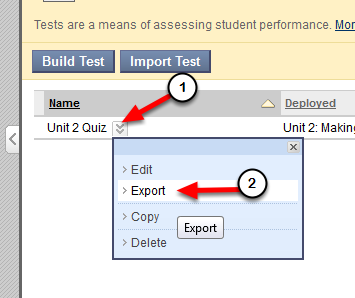 The act of deploying the test creates a column in the gradebook. If you want to copy all the test from your OLD course to a new one then you can use Course Copy (found in Control Panel > Packages and Utilties > Course Copy) and check ONLY Test, Surveys and Pools. This is where Tests, Surveys and Pools “live”. They will all copy to your NEW course but not be deployed. 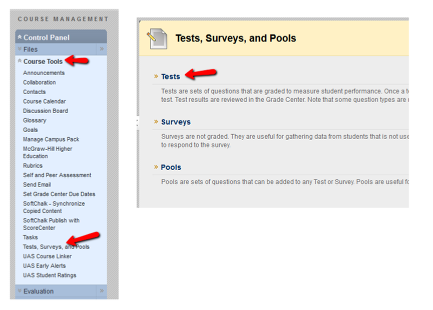 If you copy a Content Area where tests are deployed you must ALSO copy the Grade Center (once a test is deployed it gets an associated column in the Grade Center) AND “Tests, Surveys and Pools” since that is where the test actually lives. A test that pulls from other Tests or Pools as Random Blocks or Question Sets must be copied simultaneously with those other tests or pools – the only way to to that is to use Course Copy to copy all Tests, Surveys and Pools (and delete the ones you don’t want). Note: January 2013: Course Copy is temporarily (we hope) not working – use the Export/Import – Export from your old class, then Import to your new class. To move a class from one server to another you need to Export the course from the old server then import to the new server. This lesson describes how to Export from Blacboard and Import to another Blackboard. This involves saving a zipped file to your computer from the old server then importing that same zipped file to the new server. 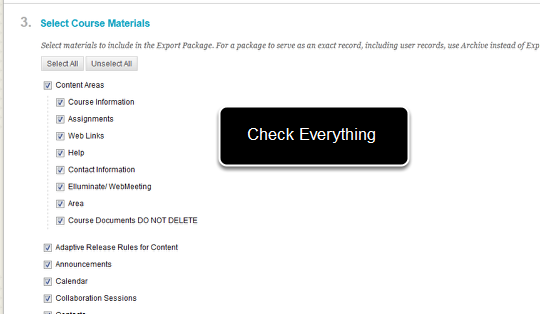 The safest way to export is to check everything! It doesn’t hurt to check things you don’t use and it can cause big problems to export content areas that contain tests, discussion board or anything linked to the gradebook without also exporting the grade center – it is easier to delete things you don’t need later than to try and repair things from a partial export. If you are sure you know what you want to export you don’t have to check everything – just be sure that if you export the grade center you export all content areas or discussions that have quizzes, graded discussions, assignments, etc linked to the grade center, and visa versa. Scroll down and click Submit after checking everything. You’ll get a message that your export has been queued and you’ll get an email when its done. The amount of time this takes can vary. 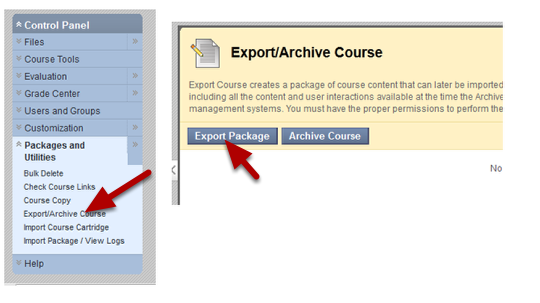 Note – you don’t have to stay on this page – you can go to other courses and set up the export for them as well. 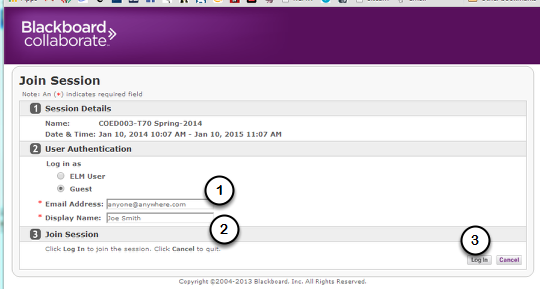 After you get your email notification return to the old Blackboard course, click on the link shown and save the zip file to your computer. Be sure and save the zip file in a timely manner – the link will disappear after a while. It does’t matter if you rename the file as long as you keep the zip extension. Browse and find the zipped file that you previously saved. Again it will take a while for the process to complete. You’ll get an email when it is finished. DO NOT EDIT YOUR COURSE WHILE THE PROCESS IS UNDERWAY. A link to a log file will appear in the Import/View logs panel. The log file will may have some errors and warnings. The best thing is to view your imported content and contact the helpdesk with information about which course/semester you are working with. Problems can arise if you have a) Publishers content which is copyright – in that case you may need to contact the publisher to get a new course package or b) unusual characters in tests or other issues. The content areas from your old course will be imported into your new course – you’ll need to re-order them and control their availability. Discussion posts may also be imported with your course. These will be relabeled as Anonymous. You will need to go into the Discussion forum, Select All of the posts and delete them to empty your discussion forums. If you delete things from your course menu you’ll need to "refresh" (labeled (2) above) in order to see what is deleted. If you used the campus pack blog/wiki you may need to export that seperately (from within the wiki or blog) and import (by creating a new campus pack blog/wiki and then choosing Import. This tutorial explains how to add a Webmeeting to your UAS Online Portfolio page. This webmeeting can be set so anyone can join it – use it to host Office Hours for multiple classes at the same time or to meet with advisees or colleagues. After creating the webmeeting you can send the link to anyone in an email or post it as an External Link or URL in Blackboard. Any UA employee or student who has an account on UAS Online (http:/www.uas.alaska.edu/online ) has a portfolio automatically created for them. After you login to UAS online (same login as your UAS email ) you can get to your Portolio by clicking on the link in the upper right. Once your’re in your portfolio you will want to add a new Sub-page. This is because we’re going to change the permissions of that page, so you may not want it on the front page of your portfolio. Click on the button "Add a New Sub-Page"
Make sure you click Save before the next step! In the upper left of the portfolio page, click on the name of your new page (Webmeeting in this example) to navigate to the new page. 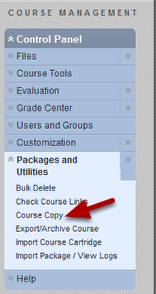 As long as your courses are on the same server, you can use Course Copy to copy a course from semester to semester. (Note that on UAS Blackboard, BBSANDBOX and BBDEV are actually separate servers – in that case you would need to export/import to move courses between servers). The course shell for your new course will need to have already been created in order to do a course copy. Click Select All to choose everything. If you have files that are not directly linked from your content areas (for example a Softchalk lesson or HTML files prepared from Powerpoint which actually contain multiple files or images, then you’ll need to uncheck the box that says "Limit Package to only files linked to in the selected content areas" This will copy all the files in your Files area. Click Submit to initiate the course copy. You’ll get a message that your course copy has been queued and you’ll get an email when its done. The amount of time this takes can vary. DO NOT EDIT THE COURSE UNTIL THE COPY PROCESS IS COMPLETE – in fact it can be a good idea to wait for half an hour after you get the email. A new menu item will be created for any new content areas you made or any you renamed – for example if you renamed Course Content to Course Assignments then a new entry on the course menu will be created. The new items will be located at the bottom of the course menu. You’ll need to re-order them and control their availability. If you want to prohibit Guest from viewing some content then you’ll need to choose "Deny Guests" next to the course menu entries for those content areas. If you want to hide any content area while you are updating it then choose "Hide Link" from the drop-down menu next to the menu item name. To move a class from one server to another you need to Export the course from the old server then import to the new server. This lesson describes how to Export from UAF Blacboard and Import to UAS Blackboard. This involves saving a zipped file to your computer from the old server then importing that same zipped file to the new server. Note: Exports from a newer version of Blackboard to an older version do not work well. You should EXPORT from UAF Blackboard before the end of the Fall 2012 semester and SAVE the resulting zipped file to your computer. Then you’ll WAIT until the UAS Blackboard is upgraded (between semesters) and IMPORT that zipped file into you Spring 2013 course. Now is a good time to save exports from all your UAF courses even if you are not yet teaching them in the spring. After you get your email notification return to the UAF Blackboard course, click on the link shown and save the zip file to your computer. 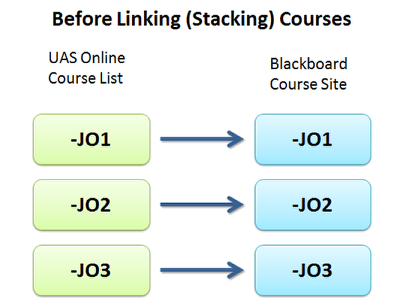 Note that although UAS Blackboard is upgrading the "look" won’t change to match UAF Blackboard (at least for the Spring semester). Nonetheless, it will be a newer version. A link to a log file will appear in the Import/View logs panel. The log file will almost certainly have some errors and warnings. The best thing is to view your imported content and contact the helpdesk with information about which course/semester you are working with. Problems can arise if you have a) Publishers content which is copyright – in that case you may need to contact the publisher to get a new course package or b) unusual characters in tests or other issues. The content areas from your old course will be imported into your new course – you’ll need to re-order them and control their availability. (In UAF Blackboard course sites where limited to students. UAS Blackboard allows guest and if you want to prohibit Guest from viewing some content then you’ll need to choose "Deny Guests" next to the course menu entries for those content areas. This tutorial explains how to review the results of an online test. The instructor reviews results through the "Grade Center", and the student reviews results through "My Grades". Find the column for the test. You can simplify the gradebook view by using the "Filter" function found to the upper right of the grade center. This lets you filter by category. Note – you’ll have to change the filter back to "All Categories" to see the full grade center again. You can also "Download Results" – read the instructions carefull to save the results. Attempts Statistics will give you a question by question breakdown showing what persentage of students submitted each answer as well as over-all statistics for the test. To view individual student grades, go to the first student that has a result in the gradebook. 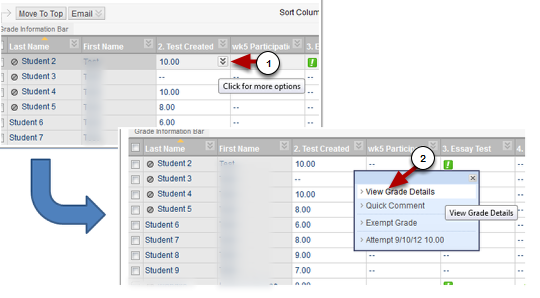 From the drop-down menu next to their score in the column ( (1) this only shows when you move your mouse over that area in the gradebook column) choose (2) View Grade Details. Now click View Attempt for that student. You’ll only have to do two clicks for the first student – after that it becomes easier!!! Note also the link that says "Test Information" (2) – this can be important! Expanding "Test Information" by clicking on it lets you know how long the attempt took etc. It is also one way to Clear the Attempt or to Submit an Attempt for a student who takes part of the test then either times out or has a glitch while submitting. Essay Tests (tests with question type Essay) are graded in the same way. You will of course have to give the grades manually – each question will have a place to enter the score for that question and an individual feedback box for each question. 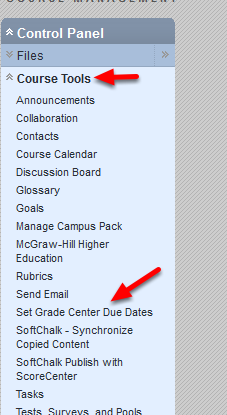 You can enter grades manually from the full grade center view. Just click once or twice on the first row that you want to enter a grade, type the grade and then Enter key. 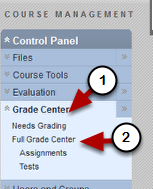 You must make "My Grades" visible before a student can see their grades and feedback – use the drop-down menu next to the My Grades link in the course menu and choose "Show Link" (it will have a square with slash through it next to the menu item name if it is hidden). The student will see all the gradebook "columns" down the page when they view My Grades. The score of their test will be a link (1). The will also see any feedback you have entered (2). If students click on the link for their score (then click a secont time on the score on the next page) they can review their test. What they see depends on the level of feedback you have set in "Test Options" when you deploy the test – if you have set only "score" then they cannot review the test. You can also choose to show their answers, the correct answers, and general feedback (if the instructor has entered it when making the test). 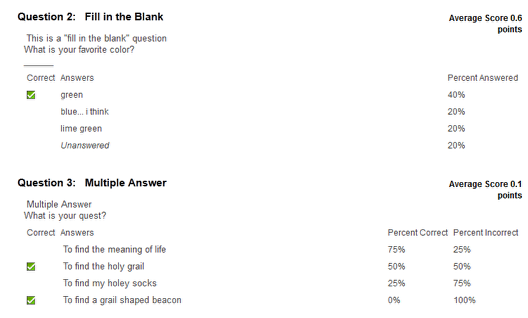 In the example above both "submitted answer" and "correct answer" have been selected. While a test is available you may only wish to show the students their score. They will see this immediately after taking the test and when they go to My Grades. Note: for Essay test the correct answer is a model answer which the student can compare their own answer to. Change the availability or level of feedback by editing test options – go to the drop-down menu next to the test name and choose "Edit Test Options"
You can link course sections together using the UAS Online Course Linker tool. This is found in the Control Panel under Course Tools and alphabetically as "UAS Course Linker"
Once two sections are linked (or "stacked") the course list will roll over and all your students will be in the main course site and their grades will be in that gradebook. This is the only site you will edit. Course Materials and Grades will NOT be copied over if you unlink the courses later – you should only do this before the start of the semester if you change your mind because the student’s work will not be copied to the unlinked sections. 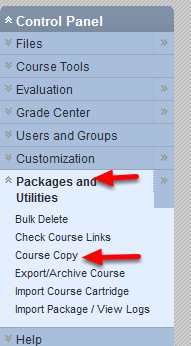 If you wish to COPY course material between course sites (but leave the gradebooks separate) then you can set up one course site with all the materials you want (and even set up columns and weighted totals in the gradebook) then use the Course Copy (found in Control Panel > Packages and Utilities> Course Copy). 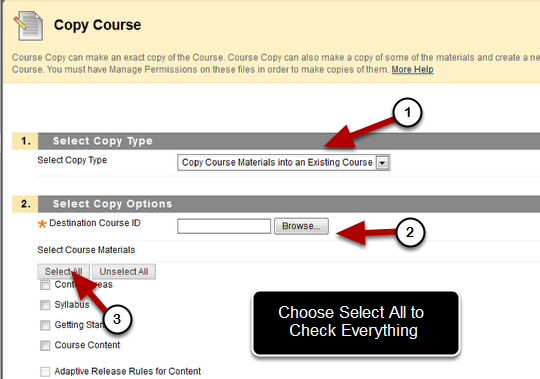 Be sure and choose "Copy to an Existing Course" then browse and find the course/section you want to copy to. Check off the boxes for what you wish to copy – it doesn’t hurt to check everything. If you copy Content Areas which contain Tests, Assignments etc. that are linked to the Grade Center you must also copy the Grade Center – this doesn’t copy student records, only the structure of the gradebook. What happens – before course are linked. If you have several sections of the same course then a separate course site will be created for each. In this example there are three sections. There will be three course names listed on UAS Online and they will be linked to three separate Blackboard Course sites. Many times the course material you are posting on the course sites will be the same for all three sections. To avoid having to post everything three times you can link the courses together and have all the students in one course site. This will also put all of the students in the same gradebook. After the courses are linked the students will see all of their separate sections on their UAS Online course list and you will still see all three section names – but clicking on any one gets you to the "master" course site (J01 in this example) – the one you are going to edit and add content to. The linked course (JO2 and J03) will remain empty and inaccessible (unless you unlink the courses as shown below). Let’s call those sites the seconday sites. All of your students to the gradebook and user list in the master section. When students click on their course names they will automatically go to the master section. 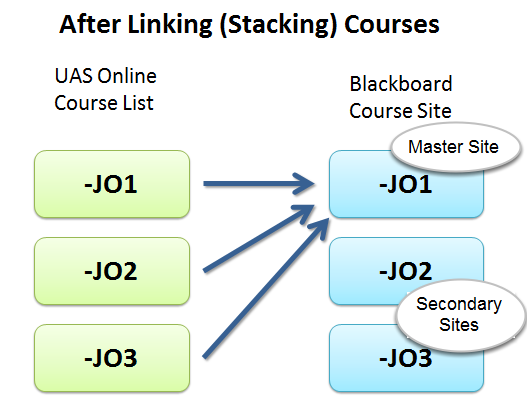 You can unlink course sites using the UAS Course Linker tool. However none of the content and student records will be copied back to the now unlinked "secondary" sections. You will usually not want to unlink sections after the start of the semester. Now UAS Online will direct both you and your students to the Blackboard course site corresponding to their section.